The Oregon Minimum Wage poster has been updated to reflect an increase in the minimum wage. The minimum wage will increase from $9.75 per hour to $10.25 per hour effective July 1, 2017. The Oregon OSHA poster has been updated to reflect the federal OSHA rule requiring employers to inform employees of their right to report work-related injuries and illnesses free from retaliation. The Oregon Minimum Wage poster has been updated to reflect an increase in the minimum wage. The minimum wage will increase from $9.25 per hour to $9.75 per hour effective July 1, 2016. The Oregon Family Leave Act poster has been updated to clarify that an eligible employee can take family leave for foster placement. The Oregon Minimum Wage poster has been updated to reflect a new minimum wage rate effective January 1, 2015. The Oregon minimum wage rate will increase from $9.10 an hour to $9.25 an hour. The Oregon Domestic Violence poster has been released by the Oregon Bureau of Labor and Industry. Employers must now provide leave for victims of domestic violence, harassment, sexual assault or stalking. 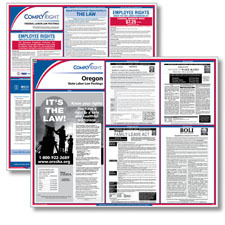 The Oregon Minimum Wage poster has been updated to reflect a new minimum wage rate effective January 1, 2014. The Oregon minimum wage rate will increase from $8.95 an hour to $9.10 an hour.